Midwest City Archives - A.I.R. Plus Inc.
R22 Refrigerant / Freon – what should the installed cost be? The overall installed cost is a good question! The answer is, it depends! Every year after 2006 the price has consistently gone up and down. Mostly up! Without reason at times, but it fluctuates, down for while, but back up shortly thereafter. The most used reasons are, EPA, demand, production cost, reclamation cost, seasonal demand, etc. But what is for sure the cost will continue you to go up every year until no one wants or needs it anymore. Production of R22 totally stops in 2019/2020 and only reclaimed/recycled R22 refrigerant will be available in the future. So, what is a good, reasonable price? It depends! Right now I’ve heard $80 a lb. to $175 a lb. We try to stay on the low side of the price range to be fair and we do that by buying the R22 refrigerant in the off season. $80 a lb. is what A.I.R. charges for R22 installed plus labor, at this time. That will probably go up in the near future as the wholesale price goes up, sorry! What are your options? Alternative refrigerants like R422, R421A, M099, NU22, etc. They usually cost half the price installed. But, they drop the capacity of the equipment and lower the overall cooling performance, especially above 90*F and in heat pumps. But, it is an option. The other option is to change out, buy new cooling equipment. Which can be expensive, but maybe necessary. Why? Because the cost of charging and or repairing the old system may not be cost effective long term. Especially if the leak in the system is not found and repaired. Thousands of dollars, versus hundreds of dollars sounds better, but long term what will the overall cost be? It depends! On you, your budget, your long term goals for your home or business, or the going rate for R22 refrigerant installed. The choice is yours! Just make sure you discuss all your options before you spend a lot of money charging an old system. And please consider repairing the leak before you have it charged. If you need help with your cooling system, R22 refrigerant prices or with any of your heating and cooling equipment, please call 405-618-2247 or 405-421-5191 and let A.I.R. Plus help you out. We provide free phone quotes on repairs and free on-site quotes or estimates for new equipment. We service all makes and brands! What does that really mean? Any HVAC contractor can typically service and or repair any brand of heating and cooling equipment you have. The parts are normally available from a local equipment wholesale distributor. There are some restrictions and or warranty issues that can come up however. For example you may have to contact the contractor that installed the HVAC equipment if it is still under a labor warranty, you would want that contractor to honor your labor warranty and parts warranty at no cost to you. Or there may be a restriction on the warranty claim for parts, the contractor that installed the equipment may be the one obligated to file the warranty on your behalf. Another example would be that the heating and cooling equipment may have been purchased online from a distributor from another state. The equipment may still be under a parts warranty, but the parts must be shipped in from that distributor, which could take days if not weeks to receive the part and have it installed. In this case you would be out the labor cost only and maybe shipping and handling fees. Typically however, you would be able to contact most HVAC Contractors and they can service your heating and cooling equipment with no problems. Just be sure to ask up front when you call for service if they can service the brand you have. A.I.R. Plus can service and repair most brands, Trane, Ruud, Rheem, Lennox, Carrier, Coleman, Evcon, Goodman, GMC, Bryant, Heil, American Standard, Payne, York, Ameristar, Aireflo, Comfort Maker, GMC, Westinghouse, Armstrong just to name a few. What brand name product do you have? Need a new gas furnace? You may qualify for up to $2500 in rebates through the Oklahoma Natural Gas Energy-Efficiency Program. If you have consider replacing your gas furnace and replacing it with a high efficiency rating this may be a great way to save some money and improve your comfort level during the cold weather. Or call A.I.R. Plus as 405-618-2247 or 405-421-5191 for additional information and details. How much should an A/C, Heating or Air Conditioner Service Call Cost? At A.I.R. Plus we charge only a Service Call Fee for quick repairs. What is a quick repair? Any repair that takes less than an hour to complete. So let’s say you call us for service. We arrive at your home and diagnose the problems as just a faulty capacitor on the blower motor inside the furnace. We would get your approval for the repair and quote you the cost for Service Call Fee and the part. We would not charge you a service call fee and a labor fee. Just one price for the service and the part. If the repair would take longer than an hour to complete. We would only charge labor cost AFTER THE FIRST HOUR OF ACTUAL LABOR PERFROMED FOR THE REPAIR. So don’t get caught by the double charges and misleading tactics of some of the HVAC business out there. Ask upfront how much the service call is and what it includes. For comfortable air call A.I.R. Plus today at 40-618-2247 or 405-421-5191 for immediate service on your air conditioning, heating or cooling system. A/C or Air Conditioner Leak! What kind of damage can it cause? Look closely and you can see the hole on the bottom left hand side of the picture. This A/C leak destroyed flooring and trim in home. The home owner had to have the evaporator coil replaced to stop the leaking water into the hall way of their home. Electrical shorts were caused by this A/C drain not being properly maintained. Luckily the home owner was home when the short occurred and shut the A/C unit off at the electrical breaker. Otherwise it could have caused a serious and hazardous fire! Look at the mold growth on this air handler in the attic. The mold from the backed up drain was so bad it was growing on the outside of the A/C equipment! 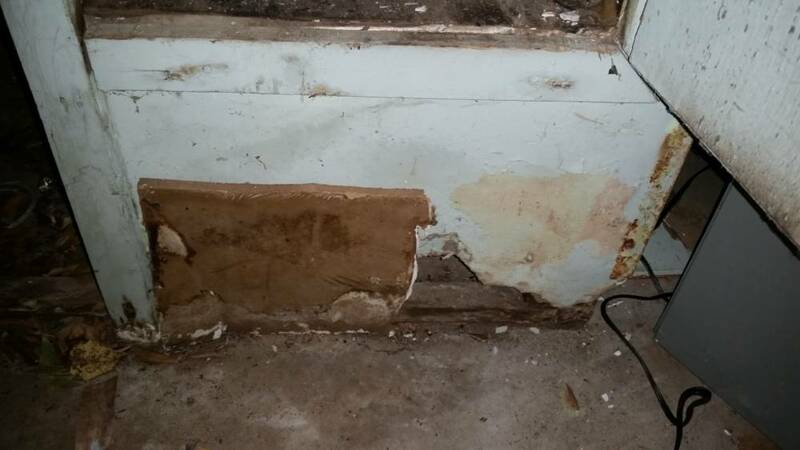 This mold contaminated air is being introduced to their home and lungs! Please do not let a drain issue persist, it can cause serious damage and cost many of dollars to repair after the fact. Call A.I.R. Plus today if you need help with an A/C drain issue at 405-618-21247 or 405-421-5191 or go to or website at airokc.com to schedule an appointment online. How much does a new A/C or Air Conditioner cost? The cost for a new a/c unit or system can be very complex. In fact there is not a simple straight forward answer without some detailed information gathered at your home or business. For example: You have may have a 5-year old complete heating and cooling system and it just went out of factory part warranty coverage and your indoor equipment (furnace and evaporator coil) are in good shape and have more life in them. You may not need to purchase the entire system, just the outdoor a/c condensing unit is all you need. Especially if it operates on the newer 410A refrigerant. So all you need is an estimate for the outdoor equipment and this may save you thousands of dollars in replacement cost. Another example: You have a 11 year old complete system, operating on R22 refrigerant (R22 is the old refrigerant that is being deleted by the year 2020) and you find out you have a leak in the evaporator coil and the compressor is weak on the outdoor unit when it runs! But the system is a heat pump system set-up on dual fuel (gas furnace inside instead of an air handler) and the furnace has hardly been used because the heat pump has been used for all the heating for your home or business. The furnace may be of value for another 10-years if it is in good shape, which means you may only need to replace the evaporator coil and the outdoor unit -heat pump. Last example, but here are many I could use: You have a 20-year old complete heating and cooling system and you have had a major failure with the outdoor condensing unit, the compressor has failed and needs to be replaced. The evaporator coil holds a charge but it looks like it is about to fail any minute and the air handler looks like it has been standing in water with all the rust you can see from the outside and inside! It’s time! Time to replace all the equipment and get a new 10-year factory part warranty on a new complete system – indoor and outdoor equipment. Free Estimates, Free 2nd Opinions are a premium service that most HVAC – Heating and Cooling Contractors offer. If they don’t offer free on site estimates, then you need to keep calling until you find contractors that will give you free estimates and 2nd opinions. Get as many estimates as you can, this will give you some additional insight to all the options you may have. One contractor may see some other option the other did not. And always be wary of the contractor pushing for quick buying decision – quick sale! A.I.R. Plus offers free estimates and 2nd opinions for major repairs or replacement. Call 405-618-2AIR (2247) or Call 405-421-5191 today to set-up an appointment. Or go to our website airokc.com and click on Free Estimate. Annual Summer A/C Inspection pays off big for customer! A customer called A.I.R. Plus for their annual A/C inspection and during the inspection we found this issue – see attached picture. This is a very common issues found inside air handlers and furnaces. This customer had no idea this had happened and would have had to endure the discomfort for the upcoming hot summer. Luckily they called to have their A/C system checked and inspected. They said it was an investment they are glad they made! Call 405-618-2AIR today to make your investment! Or go to airokc.com to schedule an appointment on line. It is cold in here! Why? The dog chewed a hole in the heating and cooling duct work! Hole in the return air plenum/platform. As you may be able to see from the picture, a dog chewed into the bottom of this return air plenum which is located in the garage. The furnace being located in a garage area is very common, the furnace platform or return air platform/plenum in this case is one piece. So the outdoor air that is in the garage area is being pulled into the heating and cooling system. Then the heating and cooling system must heat or cool the outdoor air, not the conditioned air in the home. And this my friends is not good! Your heating and cooling system is now responsible for heating and cooling conditioned air that it has conditioned in addition to outdoor air. This system will never keep you comfortable! So, check those HVAC units that are located in the garage. You never know what they have been subjected too in the past few weeks or months and may need to be repaired. Check them especially if you are having system performance problems or concerns. Pets, bicycles, lawn mowers, cars and really any moving object can penetrate the old sheet rock casings for older systems. And penetrations are bad! Call A.I.R. Plus if you need help with your system. We would love to help you! Do you need a new Heating and Cooling System? If so make sure you receive multiple free estimates from all the contractors you contact. And if the contractor or technician try’s to charge you for the estimate, you have the wrong contractor to do the job! At A.I.R. we provide free detailed estimates for equipment replacement and for major repairs. All of our estimates will provide you with model numbers, manufacturer information, warranty information and financing information. And we always thank you for the opportunity to estimate the job and earn your business! Call 405-618-2247 or 405-421-5191 free your free estimate today!